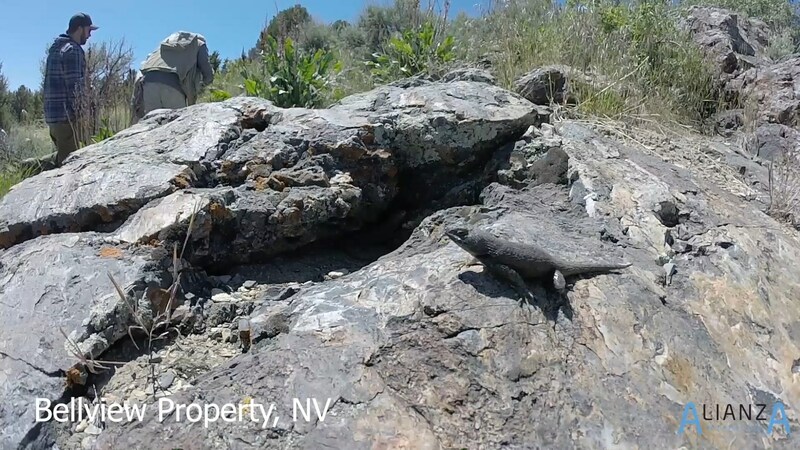 The Bellview property consists of 44 claims and is located in White Pine County, Nevada. The project is located approximately 13 km north of the Bald Mountain Gold Mine which is owned and operated by Kinross Gold. This area is the southern portion of the Carlin – Alligator Ridge Trend. 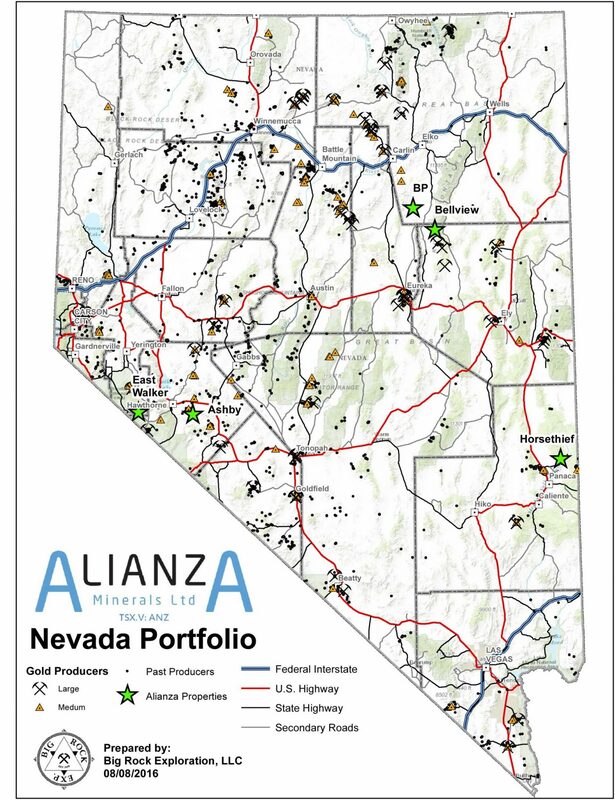 Bellview features a geological setting prospective for Sediment Hosted Gold (SHG) mineralization. 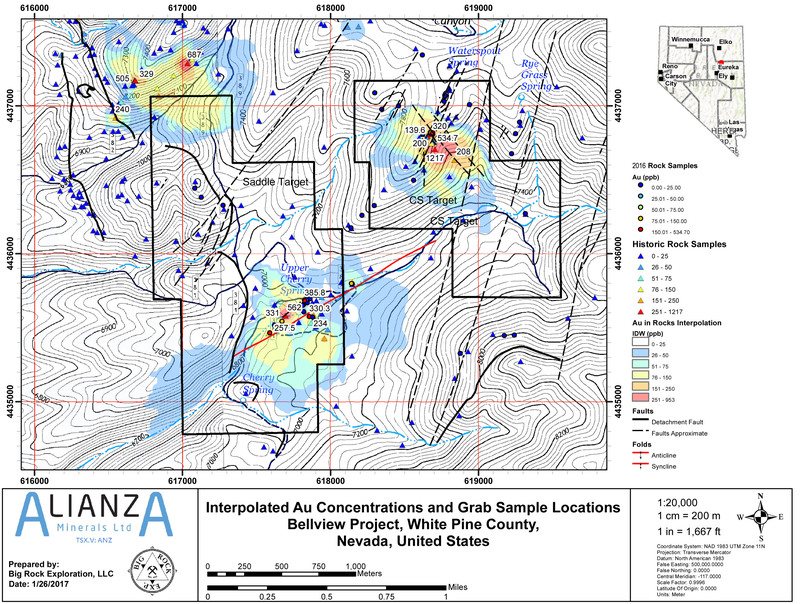 Three target areas have been identified, targeting the Secret Canyon Formation/Eldorado Formation and Hamburg/Dunderberg formation contacts, both known to host gold mineralization elsewhere in the region. In addition to the Bald Mountain Mine 13 km to the south, Teck and others identified a small, non-43-101 resource, immediately north of the property in the 1980s. Recent work by Fronteer Development identified three target areas, primarily defined by gold-in-soil geochemical anomalies, including the CS Target which features gold-bearing silicified jasperoid breccias. One sample collected from this target reportedly returned an assay of 1.22 g/t gold from silicified limestone. 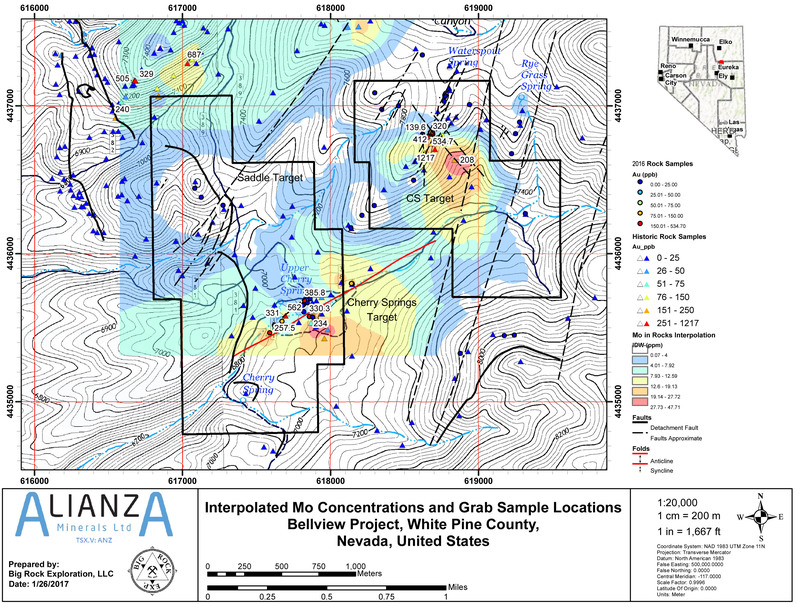 A significant northwest trending structure cuts prospective carbonate stratigraphy in this locale and is associated with elevated gold, arsenic and molybdenum geochemistry and a sub-surface Induced Polarization (IP) chargeability anomaly. The limestone units hosting this mineralization are thought to lie just above the Hamburg/Dunderberg contact which is known regionally as an important horizon for gold mineralization. This target is considered a high-priority target for drilling. The Cherry Springs target, approximately 1.5 km southwest of the CS target, displays impressive jasperoid development and strongly anomalous gold and arsenic within the Secret Canyon Formation, approximately 120 metres above the Eldorado Dolomite. Surface mineralization may represent leakage from a mineralized body at depth. Lastly, the Saddle Target is a test of the Secret Canyon-Eldorado contact horizon where IP Resisitivity indicates the contact lies 100 metres below surface. A north-northwest oriented topographic lineament runs from the Saddle to the Cherry Spring target, possibly representing a high angle structure that links the two target areas. Soil sampling of the Saddle area is the next step to identify anomalous areas of gold and pathfinder geochemistry and buried structures.